Reflective (or desperate) rebounds from the vicinity of the key long-term S&P trend-line (but not the super-cycle) were logical expectations. It's why I said on Christmas Eve that it was where a desperate effort needed to be made; regardless of the ultimate outcome. It didn't have to become 'history's largest point' (not percentage) gain; but boy did they run-in anyone flirting with a 'proximity challenge' to the trend-line. 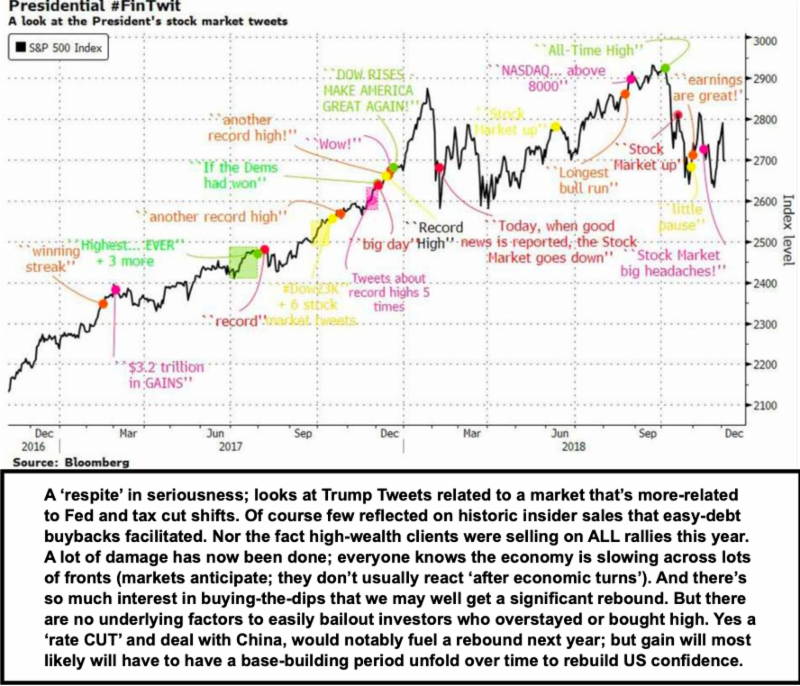 Actually this move was a little tardy; it's been about three sessions since we not only talked about seasonal rebound suitable for nibbling (not gorging) on stocks; but it's a perfect spot to swing this for four reasons: 1) tax-selling is at an end; now trades will settle in 2019; 2) algo-driven decision making had a big awareness that any close below the long-term trend-line had horrible potential consequences (given the yawning gap below), so it was their best last chance to move this market off the last-ditch precipice; and 3) year-end Pension Fund re-balancing was thought starting last week; but some did seem to wait until the last possible minute (and last possible technical point from a 'save the overall' market or portfolio perspective) to pull the trigger. One more thing: the defensive stocks were tanking Friday and Monday too (including Utilities). That's why I said it was a true 'liquidation' finally; which meant setting-up ideally for a rebound, even if temporary. Well we got one regardless of those say there was no reason. There was plenty of reason. Some say there was no catalyst, or give the President credit. Oh please. A) OPEC cuts were outlined as the turn off the low-40's in Oil was the idea; B) reports suggest the Pension purchases were about $80 Billion and most of it has hit late today, where they needed it to save the market (for the moment) and C) tax-selling is done. Those ARE the catalysts and outlined (granted of course with fingers crossed) to stimulate a short-term rebound; but leaves a lot of questions about 2019. Those have not changed, which is why we had suggested an year-end rebound, but with unfinished downside business for 2019, barring obviously a really friendlier Fed (which it was for too long; that being the problem Chairman Powell inherited); and a deal with China.